Choosing the right type of contract at the outset of any employment relationship is important to mitigate risk. Do you know the types of contracts that are available and the main differences? Under the UAE Labour Law No. 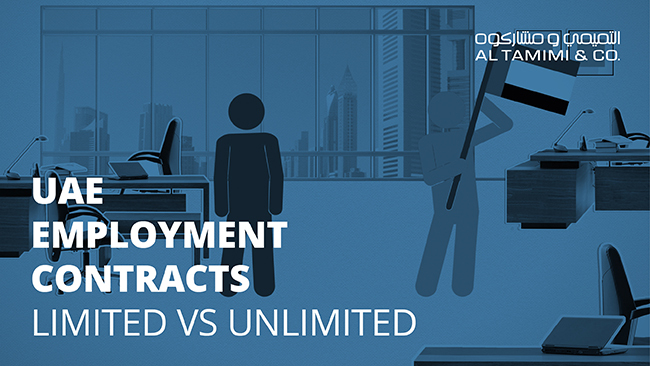 8 of 1980 (as amended) (the “UAE Labour Law”), applicable to all employers in the UAE, there are two types of employment contracts that can be issued; limited term or unlimited term contracts. There are various distinctions between the two types of contracts including the treatment of end of service gratuity entitlements and termination consequences. Al Tamimi & Company has a dedicated Employment & Incentives team. For further information, please contact Samir Kantaria (s.kantaria@tamimi.com) or Gordon Barr (g.barr@tamimi.com).